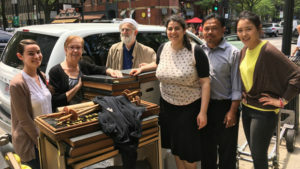 On June 16 the extensive Jewish community archives of the Jewish Historical Society of Western Massachusetts, were transferred to the Jewish Heritage Center-AJHS-New England Archives. The material will be digitally archived and available to scholars. Ken Schoen, founder of the JHSWM, is seen here third from left.